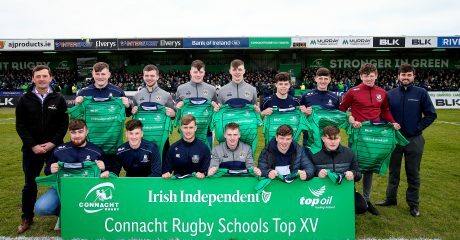 Ballyhaunis RFC played host to the first three Connacht Schools League Finals today, with the Junior Emerging, Senior Emerging and Junior Development Leagues all decided in a unique triple header of schools rugby. 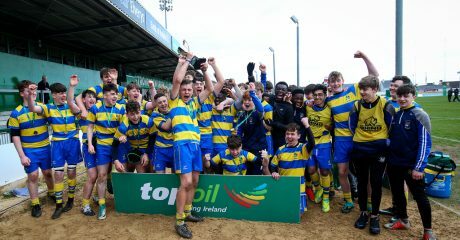 The action got underway in damp and misty conditions shortly after 11am when Athlone Community College took on Clarin College in the Junior Emerging decider. Athlone were heavily fancied leading into the tie having won all four of their pool games including a comfortable win over Clarin in the opening round, and they lived up to their billing despite an impressive showing from their opponents. 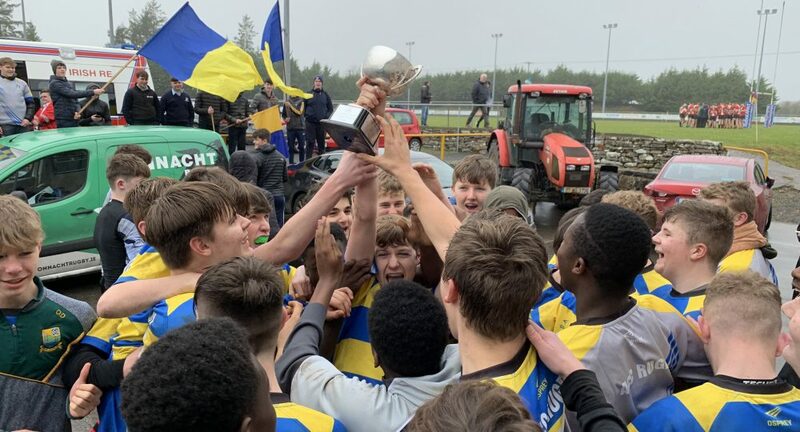 In the end the Roscommon/Westmeath side won 17-7 to take home the first trophy of the day, but there was no doubt that a potential meeting between the sides in the Schools Cup would be equally competitive. Meanwhile there was a 12pm kick-off for the Senior Emerging League final where St. Pauls Oughterard took on St. Raphaels Loughrea in a topsy-turvy encounter. Both sides went into the game with 100% records so it was always going to be a tough one to call, and in the end it was a game that went right down to the wire. Heading into the last 15 minutes St. Pauls held a narrow 8-6 lead, but up stepped impressive Raphaels fly-half Tomas Burns who nailed three brilliant penalties as the pressure on the St. Pauls defence eventually told. The Loughrea side ultimately came away with a 15-8 victory. Lastly the Junior Development decider saw the meeting of St. Geralds Castlebar and Colaiste Einde Salthill. 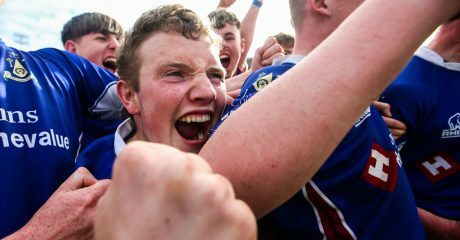 Here the game arguably turned into the best of the lot as Colaiste Einde just held on for a 15-13 win despite a massive Geralds onslaught in the closing stages. The Salthill side were looking good for the win as they led 15-3 at the break but their Castlebar opponents refused to give up, securing two well-worked tries to bring it back to a two point deficit. 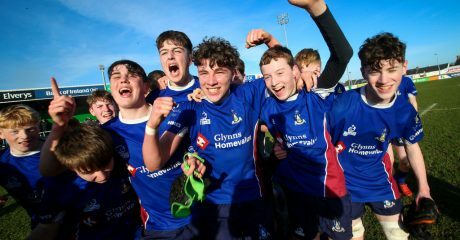 The closing stages were among the most exciting in schools rugby this season as Geralds went through at least 20 phases five metres short of the Salthill line and ultimately the victory. However it was the Einde defence that won them the game in the end, eventually forcing the knock-out and securing the title sparking wildly contrasting scenes of jubilation and dejection. A sincere thanks must go to the referees and Ballyhaunis RFC for making the day possible, and the remaining three Schools Leagues will be decided in the weeks ahead.